A screenshot from the This is a Canadian Issue website created by Asmaa Malik’s digital reporting class. In a recent article in The Atlantic, Kieran Delamont tells the story of how Indigenous people have had a difficult history of representation in video games. It’s an important story that had its genesis in a classroom in Ryerson University’s journalism school. During the 2016 Winter semester, Ryerson professor Asmaa Malik dedicated her masters level digital reporting class to working on Indigenous people’s stories. The result is “This is a Canadian Issue,” a microsite dedicated to telling a wide variety of stories about Indigenous people, from the revitalization of Indigenous languages to an interactive story on the importance of reclaiming traditional naming practices. “I was kind of trying to figure out what would be one thing that we could all learn at the same pace,” said Malik. To her, learning about digital reporting tools is important but without the reporting to support the tools, it can be an empty exercise. “What was really important for me with this class is that people understand that reporting for digital is in some ways no different than reporting for print but in some ways very different,” Malik explained. 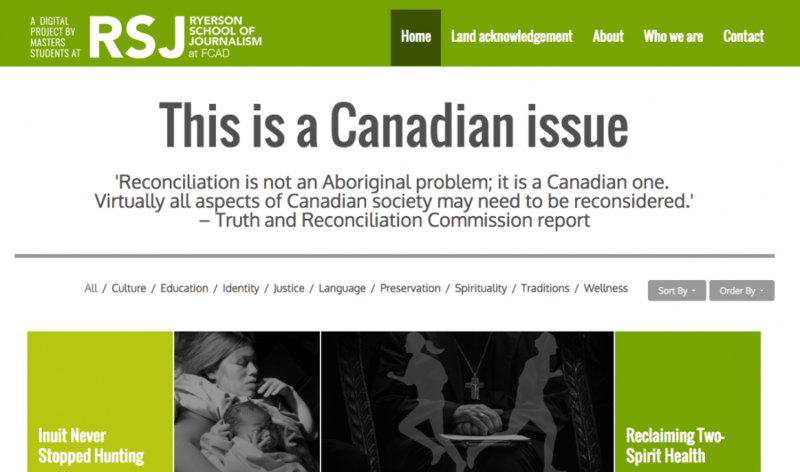 The recently released Truth and Reconciliation Commission of Canada final report tasked Canadian journalism schools with teaching students “the history of Aboriginal peoples, including the history and legacy of residential schools.” The report was front-of-mind for Malik, and she used the calls to action contained in the report as a springboard for her students to look for their stories. To help her students prepare for their subjects, Malik worked with Journalists for Human Rights. Hannah Clifford, JHR program associate for the Indigenous reporting program, and program manager Miles Kenyon led a workshop on how to report on Indigenous stories. “Reconciliation is not an Aboriginal problem—it’s a Canadian one,” said Clifford, who noted that there has been a lack of education around Indigenous issues in Canadian journalism schools. JHR has been partnering with schools to ensure that journalists have the necessary training before they go into the field. “If journalists are not able to effectively and accurately report on Indigenous issues, how are readers then accurately educated and able to engage in the conversation fully?” said Clifford. She pointed out that a class project like Malik’s is important to further the discussion, adding that she would love to see similar projects across Canada. In total, the students spent about four weeks discussing the TRC recommendations and finding resources for the stories, which they then worked on for the rest of the semester. Malik said they also learned a lot from the process of doing the reporting. “We weren’t just going for the usual sources,” she said. JHR’s staff also helped edit the final pieces. The resulting stories have drawn attention from several North American media outlets. Delamont’s piece, which was picked up by The Atlantic on June 2, came about after classroom conversations about appropriation. Two stories were published by TVO—one by Steph Wechsler about how urban health care providers provide services to LGBTQ Indigenous people and another by Brittany Spencer about the lack of Indigenous history lessons in Ontario schools. Malik found some students had some trepidation about tackling these stories. But she told them it was important for them to move outside their comfort zones. And it gave the students an opportunity to have their stories read well outside the confines of Ryerson. “Knowing that actually…it’s going be read quite widely, on one hand it can be scary but on the other hand it’s so affirming and so great to actually have an impact,” said Malik. This article originally appeared on J-Source. Republished with permission.